The Star Wars films have maintained a tremendous following for almost forty years, attracting successive generations of audiences while sustaining their appeal for lifelong fans. As viewers return to these stories again and again, the movies exert tremendous influence on their perceptions of the world. Star Wars offers an accessible starting point for considering substantive issues of faith, philosophy, and ethics. In A True Hope, Joshua Hays explores some of these challenging ideas through the sayings of the Jedi Masters, encouraging Christians to reflect on them thoughtfully. In so doing, Hays examines the ways the worldview of the Jedi is at odds with that of the Bible. Readers who accompany Hays on this journey will continue to enjoy the entertainment of the Star Wars galaxy while strengthening the stability and coherence of their faith. Joshua Hays has been a voracious Star Wars fan since age nine and collected memorabilia related to the films for more than fifteen years. Since earning a BA in Christian Ethics from Union University and an MDiv from Samford University, Joshua has merged his passions for Star Wars and theology, writing on the intersection of faith and the Force for Preaching magazine and presenting at several conferences and retreats. He has also incorporated Star Wars into his teaching while serving on staff at several churches in Tennessee and Alabama. Joshua currently serves as a Research Associate for Baylor University’s Institute for Studies of Religion. He resides in Waco, Texas, with his wife, Rebecca Poe Hays. Star Wars goes ever on, and Joshua Hays has given us an interpretation that explains its power as an enduring story of our times. In so doing, he turns to another story that he argues will endure as truth forever. Hays thus enlightens us as much about the teachings of Jesus in the Bible as about the underlying beliefs in Star Wars that drive its plot and fill out its characters. 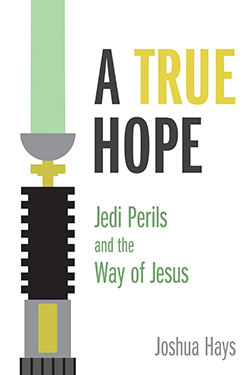 By juxtaposing the foundation of hope that is portrayed in Star Wars with the different foundation in the incarnate Christ’s teaching, Hays powerfully illuminates both for today’s reader. Many authors have tried to understand Star Wars through the lens of Christianity. Joshua Hays’s new book, A True Hope, explores that idea but also considers other historical philosophies and religions that helped shape the world of Star Wars, and the result is a fascinating look at biblical ideas and their influence on George Lucas’s storytelling, whether intentional or not. Augustine tells us that whatever is beautiful and true is of God. In this thoughtful exploration of the Christian lessons to be learned from one of the most popular narratives of our time, Joshua Hays offers us a gift. Whether you are a passionate fan, an interested person of faith, or merely a curious bystander, you will discover in these pages what is beautiful and true in Star Wars.